This article studies the effects of 600mg testosterone injections weekly for 10 weeks compared to a placebo. It also studies the effect of testosterone injections on exercising and non-exercising individuals. Read on to see the amazing results. Let’s get straight to some data before discussing it. These charts show the effect of testosterone injections on fat-free mass, muscle size and strength. 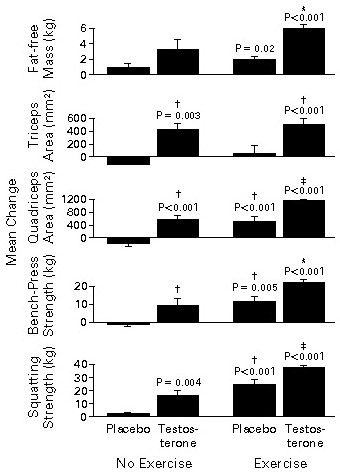 Notice that the testosterone users gained strength and size even without exercise! That is like magic, far superior to any regular supplements that we’ve reviewed. Take a look at the fat-free mass; the non-exercising testosterone users put on 3+ kilos of muscle in 10 weeks, that is amazing. 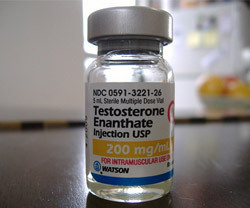 Would the gains reverse if they stopped injecting testosterone? I haven’t yet seen a journal article researching that question. Post a comment if you know of one. As for the participants for did exercise, the testosterone users had 3x more muscle gain than the placebo group. In the triceps muscle, the testosterone users got about 15x the gains. Strength was the least extreme result, showing testosterone users gaining 50-100% more strength than the placebo group. Below is the data from the above charts in tabulated form. Serum concentrations data is important to see how much of the testosterone the body retained and how much above baseline it peaked. These results are also extreme. 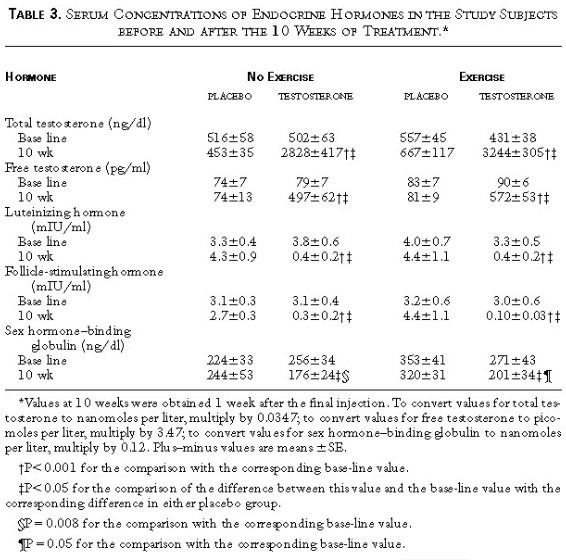 After 10 weeks of injecting 600mg per week, the testosterone users had increased their serum concentration from a normal 400-500 ng/dl to 2800-3300 ng/dl, roughly a 500-600% increase. Clearly the body has retained a huge amount of the testosterone, and these levels are not achievable through natural methods such as improved lifestyle. A more conservative increase can be achieved through lifestyle changes however, which you can read about here – How to Increase Testosterone Naturally. A further important thing to note is that the wives and parents of the testosterone using participants reported no changes in anger, mood or behavior. With testosterone supplementation being such a huge advantage, roughly tripling muscle gains, it’s hard to believe that top body builders are not using testosterone. An interesting further research topic would be to find out the time it takes the body to return to regular testosterone levels, for competitors to beat a sports related blood test for example. 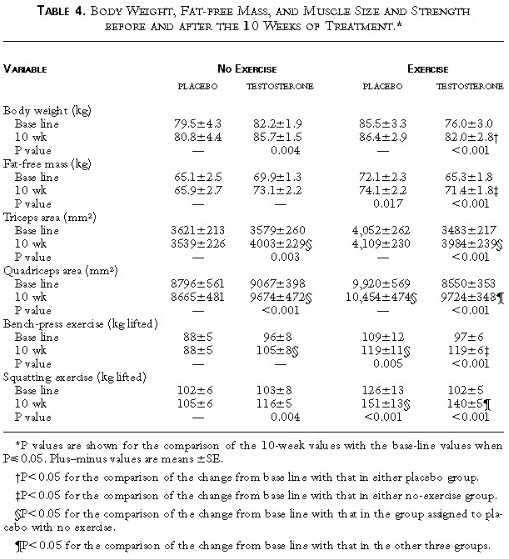 No Responses to "The Effect of Testosterone on Strength and Size (6kg Muscle in 10 Weeks)"